A lady friend asked me what is the English equivalent for the Chinese phrase 女强人 (nǚqiángrén). The literal translation of 女强人 is “strong woman”. Some of the English equivalents I can think of are career woman, superwoman, ambitious woman, strong woman, iron lady, but none of them carries the same essence or connotation as 女强人. The latter was originated from the Hong Kong TVB soap opera named 家变 (the Family Saga) in 1977. The lady lead character therein named 洛琳 took over her father’s business when he disappeared. She managed the business single-handedly. She not only survived in a men dominated environment but also grew the business into a successful empire. She was nick-named 女强人 in the series. From then on, in Hong Kong, when a woman who is aggressive, ambitious, not afraid of competitions from her men counterparts or who is prepared to give up personal or family lives in order to get to the top or be successful, she would be called 女强人. In the circumstances, I think the best translation for 女强人 would be “superwoman”. Today is the Woman’s Day. Since I am on the subject. 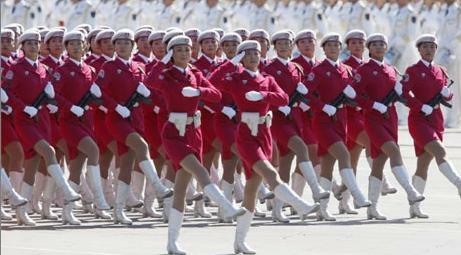 I would like to salute the women in China. Some of my Mainland Chinese lady friends are single mothers, who have to work hard and raise their children and support their parents on their own. Many of them got discriminated and have to tackle personal emotional issues too. To me they are the real nǚqiángrén 女强人. According to a survey published by the Citibank in February, 2010, the number of Hong Kong female millionaires, in 2009, exceeds their male counterparts. According to the survey, 394,000 residents in the city possess current assets of one million Hong Kong dollars or more (about US $130,000), Among them, 52% are women and 48% are men. According to The Grant Thornton International Business Owner Survey in 2006, about 35% of Hong Kong companies employ women in senior management positions, a figure significantly higher than in Canada, UK, Germany, and France. Madam Chu Lam Yiu of Hong Kong, the founder of Huabao International, a maker of fragrances and flavourings, have personal assets of US$1.5 billion in 2009, comparing to US$2.7 billion for Opray Winfield US$1.6 billion for Madam Zhang Xin of SOHO of Mainland China. The deceased Madam Nina Kung, then Chairwoman of Chinachem of Hong Kong had been the richest woman in Asia for many years before she passed away in 2007. Her estate is said to be worth US$13 billion. Many of the Hong Kong doctors, lawyers, certified accountants, politicians, high ranking civil servants & etc. are women. In particular the heads of the two largest law firms in Hong Kong are women. It is a well known fact that Hong Kong career women enjoy high esteem and responsibilities and are well respected by their male counterparts. I have seen many of my lady Mainland Chinese friends possess the same attributes as their Hong Kong nǚqiángrén 女强人. I believe in the near they would enjoy the same respect and status as their Hong Kong counterpart.